DURBAN, South Africa — High above the pavement, overlooking Durban's famous South Beach and the pounding surf of the Indian Ocean, and just blocks from the United Nations Climate Change Conference, where up to 20,000 people gathered, seven activists fought against the wind to unfurl a banner that read "Listen to the People, Not the Polluters." It was no simple task. Despite the morning sun and blue sky, the wind was ferocious, and the group hanging the banner wasn't exactly welcome. They were with Greenpeace, hanging off the roof of the Protea Hotel Edward. Inside, executives gathered at the World Business Council for Sustainable Development (WBCSD), an organization that touts itself as "a CEO-led organization of forward-thinking companies that galvanizes the global business community to create a sustainable future for business, society and the environment." Down at street level, as the police gathered and scores held signs and banners and sang in solidarity with the climbers, Kumi Naidoo lambasted the WBCSD, labeling it one of Greenpeace's "Dirty Dozen." Naidoo is no stranger to action on the streets of Durban. While he is now the executive director of Greenpeace International, one of the largest and most visible global environmental organizations, in 1980, at the age of 15, he was one of millions of South Africans fighting against the racist apartheid regime. He was thrown out of high school and eventually had to go underground. He emerged in England, living in exile, and went on to become a Rhodes scholar. 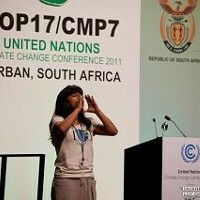 Naidoo has long struggled for human rights, against poverty and for action to combat climate change. A colleague and I scrambled up to the roof to film as the seven banner-hanging activists were arrested. South African climber Michael Baillie, one of them, told me: "Our goal here today was to highlight how governments are being unduly influenced by a handful of corporations who are trying to adversely influence the climate negotiations that are happening here in Durban. They are holding the climate hostage." Later, at the U.N. conference inside the Alfred Luthuli International Conference Center, named after an early president-general of the African National Congress and the first African to win the Nobel Peace Prize, Naidoo told me about that morning's action: "We are not opposed to the idea of dialogue with corporations, but clearly corporations are not actually moving as fast as we need them to move and, in fact, are actually holding us back. Therefore, we think that calling them out, naming and shaming them, is critically necessary so that people know why these climate talks here are not actually going as fast as we need them to go." The Dirty Dozen in Durban include Royal Dutch Shell, ExxonMobil, Koch Industries and BASF, along with industry trade groups like the U.S. Chamber of Commerce, the WBCSD and the American Petroleum Institute. 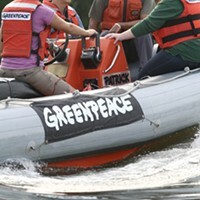 Greenpeace highlighted these corporations and corporate umbrella groups for their presence in Durban, and for their actions throughout the global-climate-change negotiating process, in undermining meaningful progress. The full report, titled "Who's holding us back? 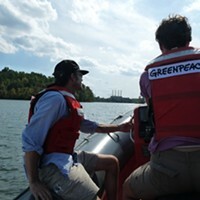 How carbon-intensive industry is preventing effective climate legislation," details how these corporations not only derail national legislation on climate change across the globe, but are also gaining privileged access to the global negotiations like these crucial United Nations talks in Durban. Former South African Archbishop Desmond Tutu addressed a rally before the summit, describing climate change as a "huge enemy. ... We are saying this is the last chance, please for goodness sake take the right decision, this is the only world we have, the only home we have, if it is destroyed, we all sink." Former Irish President Mary Robinson added, "People are suffering because of the impact of climate change, those who are suffering most are not responsible, so the rich world has to take its responsibility, we have to have a continuation of Kyoto, a track that leads to a fair, ambitious and binding agreement, and we have to do it here in Durban." There is a growing consensus here in Durban that the United States is the main impediment to progress at these crucial talks. A consortium of 16 of the major environmental groups in the U.S. wrote a letter to Secretary of State Hillary Clinton, who directly oversees the U.S. climate negotiations. They pointed out that, while President Barack Obama originally campaigned on a promise to lead in global climate negotiations, "three years later, America risks being viewed not as a global leader on climate change, but as a major obstacle to progress." The fossil-fuel industry exerts enormous influence over the U.S. government, and over the U.S. public, with tens of millions of dollars on lobbying and PR campaigns to shape public opinion. Kumi Naidoo, who has been jailed many times for his activism, compared the struggle against apartheid to the fight against climate change: "If people around the world can actually unite -- trade unions, social movements, religious leaders, environmental groups and so on, which we saw in the march on Saturday -- I pray and hope that we will have a similar kind of miracle to get these climate negotiations to deliver a fair, ambitious and legally binding outcome."